Q: Darius deals both physical and magic damage, and also has an attack speed slow on Crippling Strike...really? Q: How will you balance Darius? A: It's unclear what should be done to Darius. He's balanced, has clear strengths and weaknesses, and is much less matchup dependent than the average forum post would have you believe. Even if we remedied some of the specific complaints about him now, any bruiser that does not lean heavily on raw statistical bonuses to be successful will often generate a lot of frustration from their opponents. Raw stats tend to play out almost unnoticeably over time whereas abilities manifest their power in dramatically noticeable moments. Take Jarvan's Demacian Standard -- it's primary power is in the armor/AS boost it gives, but a good number of players don't even notice it exists. Q: Why don't u get rid of these things then? Especially the atk speed slow. You could consume the dot stats when you ult the person too. I mean there's plenty you could do to change him a little and make not so incredibly hard to lane against as melee. Nor can u build against him, free armorpen% & magic damage bleed & true damage scaling ad ult. A: I will get rid of them. It takes time to test changes and to assess what needs to be done to compensate for them. They also weren't possible prior to Season 3 when armor was ridiculously undercosted relative to its power. Interesting. I can definitely see his essentially "free harass" off his passive as being frustrating to lane against. Good thing I'm practicing being a mid main, haha. 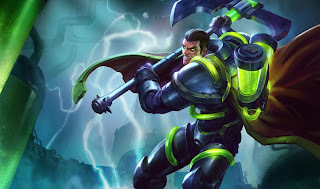 I kind of want to see the return of Garen/Renekton, though, as long as Darius doesn't fall completely out of favor. More champion diversity is always a good thing. Yeah, even though Garen's a bit one dimensional, he was definitely super fun to play. I think it's more frustrating to die slowly to dot ticks than to get instantly combo'ed by Garen tbh.